First things first: Pizza Bastani is not a vegetarian restaurant. It’s not a destination restaurant that inspires you to cross the city with dreams of a great meal. It is a good pizza and pasta joint in the middle of a Greek/Italian restaurant mecca filled with tourists and students. 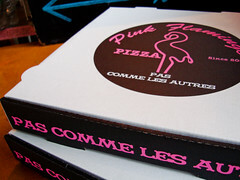 Pizza Bastani is also very close to the very popular Maoz Falafel and Le Grenier de Notre Dame. So, what does this funky little joint offer vegetarians? 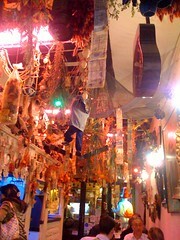 It’s a fun restaurant with a funky decor. The prices are decent and they’ve got some surprising vegetarian pizza options. 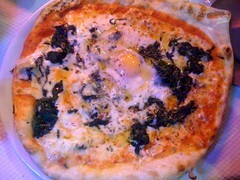 I had a pizza with blue cheese, spinach, and an egg cooked sunny-side up in the middle. It was damn good. I saw a half dozen veggie options, which is much better than the standard margarita and 4 cheese pizzas. Unfortunately, their vegan options are going to be fairly limited. I did see a pasta with eggplant, tomato, and olive oil. I don’t know if they have egg-free pasta. If you are roaming through the small, cobblestone streets of the left bank with your friends (and you want something other than falafel) try this restaurant. It’s worth a shot.